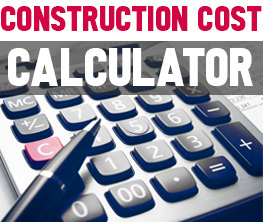 When it comes to commercial venues, small spaces are a challenge. 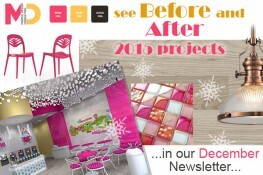 However, the right design decisions may turn this space shortage into an opportunity to create a warm and intimate place. 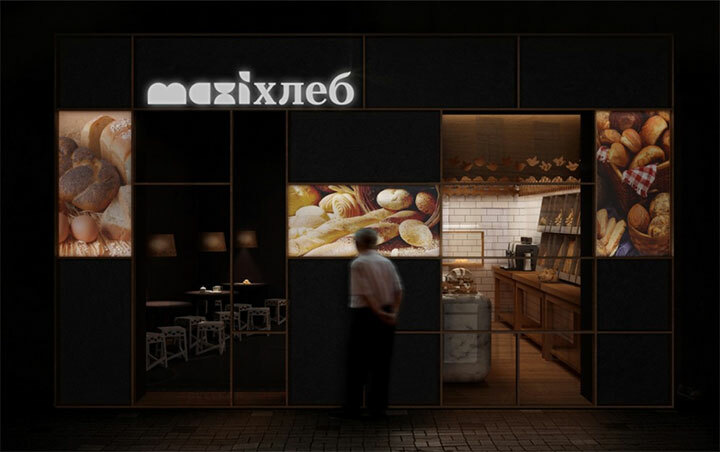 This is the case of Maxibread, a bakery that doubles as a café, located in St. Petersburg, Russia. Created by Stone Design, Maxibread combines Russian and Western design elements into a place that looks both contemporary and locally authentic. 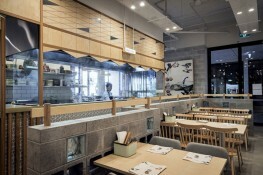 The room is dominated by a long marble counter with soft, rounded edges, giving customers the impression that they are in the presence of an object of art. 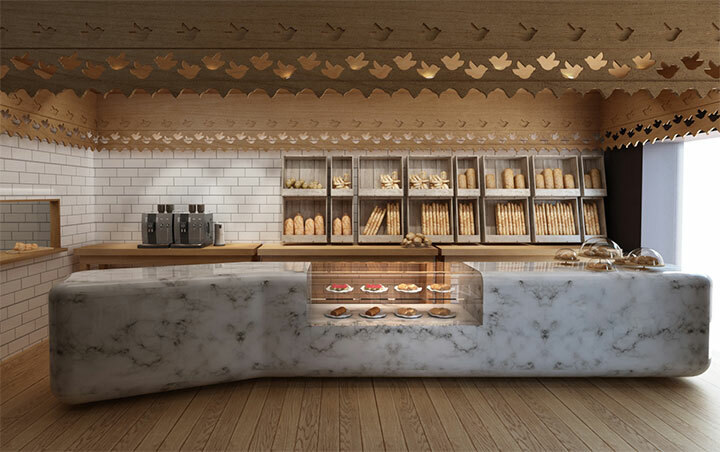 In the center, a glass display allows them to peek at bakery goods – a pleasant, colorful break in the middle of this marble mass. The light color of the counter is clean and crisp, visually opening the small space. A wooden roof with carved bird cutouts takes a traditional Russian motif found in local architecture and makes it the defining element of the room. The detail of this light wood structure contrasts with the modern simplicity of the counter, while the warmth of the wood balances the presence of stone. Design elements are well balanced. The same wood is found in other elements throughout the bakery, including the floor. The white brick wall echoes the clean look of the marble counter. 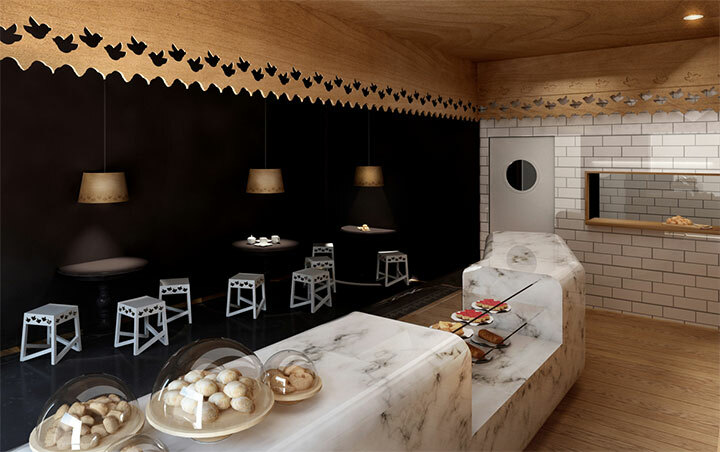 The café area, where customers can taste their bread and desserts, achieves the amazing feat of creating a completely different visual effect within the limits of the same small space. Dark walls and floors come together into a contrasting area, bathed in soft ambiance light. The café is populated by pedestal tables and white stools with simple silhouettes that appear as luminous spots in the pleasant dimness of the café. 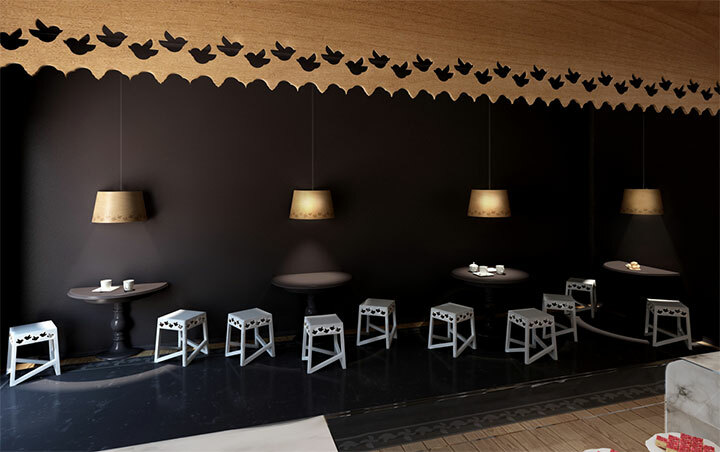 The same bird motif found on the sides of the stools ties this area to the bakery, unifying the space. 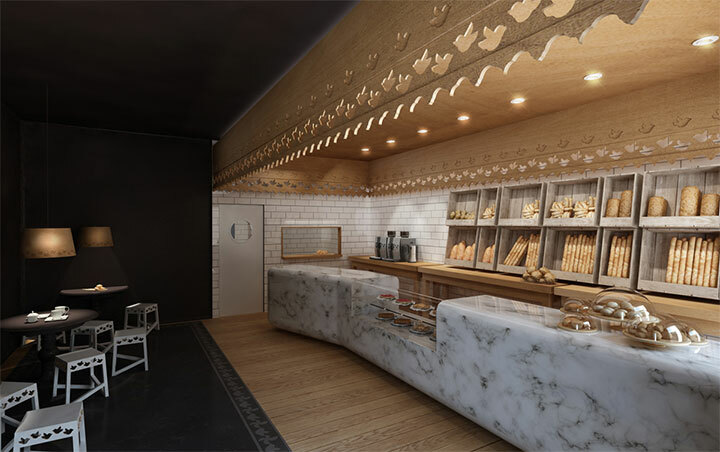 Through the smart combination of materials and ingenious design choices, Maxibread of St. Petersburg becomes a cozy, intimate space, well worth of bakery enthusiasts’ interest.